STEP 4. There has been a great increase in what I would call "Testosterone Awareness." 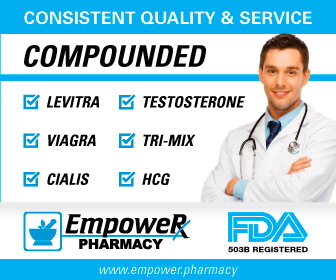 Thanks to all the recent testosterone advertisements, most men now know that they need to examine this critical hormone if they have certain symptoms such as lowered libido and loss of their edge at work thanks. Unfortunately, testosterone is not always the silver bullet that many men hope it would be and a significant percentage find that it does absolutely nothing. Frequently men in the Peak Testosterone Forum will post, "When am I going to feel anything?" The reason for this can relate to other hormones. Often it's not just testosterone levels that have plummeted but the thyroid hormones, which I discussed on my page covering Testosterone and the Thyroid, or various the adrenal hormones. On this page I'll cover Adrenal Fatigue, another fairly common condition that can affect our mood, energy and life in the bedroom. Stage I. (High Cortisol, Normal Pregnenalone, Lowered DHEA) During this stage, you experience stress of some sort (job, marriage, financial, illness, death of a loved one, etc.) and your adrenal begins to pump out extra cortisol. The elevated cortisol has many negative effects, including lowering cortisol and potentially killing brain cells. Stage II. (Normal Cortisol, Lowered Pregnenalone, Even More Lowered DHEA) This is the beginning of the "fatigue" or "exhausion" phase. The theory is that the adrenals can no longer handle the excess load and begin to decrease their output of all the key hormones. Stage III. (Low Cortisol, Lowered Pregnenalone, Very Low DHEA) This end result of the "fatigue" or "exhausion" is lowered output of all the key adrenal hormones. At this point the adrenals are depleted and can no longer function normally. Now I want to point out that adrenal fatigue is widely accepted in the alternative health community, but largely unaccepted by most endocrinologists. Keep in mind, though, that there is evidence in adrenal fatigue from athletes who have overtrained and followed similar patterns to the above-mentioned stages. And, practically speaking, many individuals fall into low DHEA and low/high cortisol. So, whether or not you accept adrenal fatigue, adrenal hormones do seem to be out of alignment quite often. a) Assess Your Symptoms. How do you test for adrenal fatigue? This is actually an involved question that is complicated by the fact that the adrenal is composed of two parts: the medulla (inner core) and the cortex (outer shell). On this page I am not going to go into the medulla hormones. These should not necessarily be ignored, but tend to be more transient and involve hormones such as epinephrine/adrenaline. It is the cortex that I am going to focus on, because it secretes more long-lasting hormones, cortisol in particular, that can wreak havoc with multiple systems and cause symptoms that are very common. Take a quick look at the following standard adrenal fatigue symptoms. How many of them apply to you? CAUTION: Of course, always get checked out by your physician if you have any of the above symptoms as they can also be signs of completely unrelated medical conditions. Notice that a lot of these symptoms are very similar to hypothyroidism and/or hypogonadism (low testosterone). Again, this is why you cannot necessarily always assume that testosterone will cure things like low libido, erectile dysfunction, fatigue and mental fog: it could by hypothyroidism or adrenal fatigue. Assuming that you have some of the above symptoms, it would be prudent in my opinion to find a good medical practitioner and get some basic testing done. This may be a forward-thinking M.D., a naturopath or perhaps an anti-aging physician. However, if all else fails, you should be able to use one of these labs to the answers that you need: Testosterone and Hormone Testing Labs. Most of these symptoms can be explained by low or high cortisol readings and so you'll probably find that testing focuses on it. Keep in mind that high cortisol will generally lower testosterone as well. The adrenals also control and are heavily involved in body functions such as a) blood sugar regulation, b) fluid retention/loss, c) immunity and d) blood pressure. If you've had inexplicable low/high readings in blood pressure and/or blood sugar, it could adrenal-related. b) Pull Your Numbers. The good news is that you can usually gain considerable useful information by just pulling two hormones in order to keep cost and confusion to a minimum. i) DHEA. DHEA is produced in several tissues including the adrenals and is considered the complement or "adversary" of cortisol. When one is up, the other is usually down and vice versa. As you might guess, there are a number of medical conditions that are tied to a high cortisol-to-DHEA ration, such as treatment resistant depression. Getting your DHEA measured can help diagnose which stage of Adrenal Fatigue you lie in. ii) 3+ Point Cortisol Read. As I mentioned, cortisol affects mood, libido and other adrenal fatigue symptoms profoundly and so it is most often recommended to get a reading first thing in the morning around 8 a.m., at noon and then at 4 or 5 p.m. The reason is simple: men can be low in cortisol at different times, something I will diccuss below. Salivary, Blood or Urine? There are actually 3 different ways to pull your cortisol and DHEA. Most of the men on the Peak Testosterone Forum that have looked into adrenal function have used a saliva test. It is usually inexpensive and you can do it from home. Furthermore, many of the experts actually prefer saliva testing and feel it is more accurate. However, if you want a blood draw, Life Extension Foundation has a 2 point cortisol read along with DHEA, insulin/glucose and a couple of other markers of adrenal function. This may be advisable is you want to take your results to show to a physician. Stage II. If your DHEA is below the lab's midrange and your cortisol is high, then you are considered in stage II adrenal fatigue. Stage III. If you DHEA is below the lab's midrange and your cortisol is near the lowest part of the lab's range or lower, then you are in stage III adrenal fatigue. 1. Stress Management. Instead of just running off and taking a bunch of supplements, one should first examine root causes: there is probably an underlying reason that your cortisol is high and it's probably stress. There are a dozen different forms of stress, but that's generally where adrenal fatigue starts and ends - stress. And all the medications and supplements in the world aren't going to help unless practical ways are learned to manage it. As you probably know, stress managment is a whole field. However, I have many practical and easy-to-learn suggestions that I discuss in my Summary Page on Stress and Cortisol. I want to highlight two important ones: Secular Mindfulness Meditation and Progessive Muscle Relaxation. Both of these are non-religious body-mind disciplines and are proven cortisol-busters in the research. Furthermore, they are very easy to learn and do. 15 minutes a couple of times per day and you're done. But there are many other proven ways to lower cortisol, including yoga, Tai Chi, walking (in a relaxing environment), massage and on and on. Pick a couple and get good at them and give your poor adrenals a break! 2. Sleep Management. I would guess that half of all Adrenal Fatigue cases could be eliminated by simply getting more sleep. A recent study clearly showed that we need (at least) 7.5 hours of sleep. If subjects got any less, their inflammation and immunity and stress reactivity went down the toilet. Many studies have shown elevated cortisol levels with lowered sleep time. If you need help going to sleep, then see my Sleep Aid Page for many research-backed ideas. Also, many men have sleep disorders such as apnea, restless leg syndrome, loud snoring and on and on. Most of these will benefit significantly from dropping the pounds and some sort of medical therapy. (For more information, see my page on The Incredible Benefits of Sleep (Including Testosterone). 3. Phosphatidylserine (PS or S-PS). If a man has high cortisol, one common solution is phosphatidylserine, and a number of prominent alternative practitioners state that it can lower cortisol levels. Typically it is taken at the same time as your high cortisol reading. In other words, if you have high cortisol in the afternoon, then the PS is taken at that time. Unfortunately, it is a fairly expensive supplement. One should probably try a smaller dosage, such as 50 mg, and see if that is effective. However, I often see men taking larger dosages in the 100, 200 or even higher range. CAUTION: Long term safety is poorly understood. 4. Vitamin C. Linus Pauling noted that humans are one of the few mammals that cannot manufacture their own Vitamin C. His theory was that this was a bad mutation that we have somewhat adapted to live with but that we actually do better with megadoses of Vitamin C. Whether or not you buy into this theory, one thing that does seem to be true for many men is that they do better in the stress/cortisol department with megadoses of Vitamin C. Vitamin C may or may not actually lower baseline levels of cortisol, but what has been shown in a number of studies is that Vitamin C lowers the increase in cortisol that comes from a variety of stressors. I have some coverage of this here in my page on Why Take Vitamin C? and Vitamin C and Phosphatidylserine. CAUTION: Vitamin C should be taken in the "Ester-C" form on an empty stomach as it can increase iron absorption. 1. Overtraining. Many men end up with adrenal fatigue from overtraining. It is hard for many men to not ignore pain and just keep pushing themselves. If there is any chance you are overtraining, then it's time to stop. I had to do this myself for a time and bought a book by Phil Maffetone, who discusses the use of monitoring pulse to force yourself not to go overboard. 2. Pregnenalone. One adrenal-related supplement that has grown in popularity is pregnenalone. Pregnenalone is the "Mother of All Hormones", because it is essentially right below cholesterol in the Hormone Pyramid. The theory is that if a man take pregnenalone, then the body can utilize it downstream (for testosterone, cortisol, progesterone, DHEA, etc.) however it needs. "The body knows best" is the kind of naturopathic philosophy that has arisen. And what is nice is that pregnenalone seems to have few side effects and very few downsides, unlike some of the other adrenal hormones such as DHEA. (Excess DHEA has been found accumulated in the brains of Alzheimer patients. It may not be causative, but some concern is warranted.) If you have any medical conditions or are on any medications, talk to your doctor first. Occasionally, pregnenalone can have a sedating effect. Practically speaking, pregnenalone really seems to help some low cortisol men with Adrenal Fatigue symptoms. In addition, it does often raise cortisol. Common dosages 50 mg a few times per day. Some men have taken more in order to raise their cortisol. CAUTION: Even though side effects are minimal, long term safety is poorly understood. 4. Hyrdrocortisone (HC). This is just the chemical, pharmaceutical way to say cortisol. Some alternative practitioners will give their male patients HC in small dosages of between 5 and 40 mg/day. Again, the theory is that adding some cortisol exogenously "gives your adrenals a rest" and lets them recover. This is usually done for a few months only at a time. I am cautious about cortisol, because elevated amounts do so many negative things: increase visceral fat, kill neurons, lower testosterone, etc. Admittedly, if you are low cortisol, that is likely an entirely different thing. However, HC (20 mg) has also been shown to decrease REM sleep. It may also increase anxiety in some men according to one study. So you can try it, but it would seem prudent to use it as low dose and as short term as possible. 5. CAUTION: Licorice Extract. Many alternative practitioners recommend licorice extract to raise cortisol levels. I am very cautious about this one as well, because it has been shown in several studies in animals and women to lower testosterone. Yes, raising cortisol but licorice's action seem to go beyond this, and I don't see the need to lower your T in order to improve your cortisol levels. 1) Psychoneuroendocrinology, 2009 Jan, 34(1):19-26, "The ratio of cortisol/DHEA in treatment resistant depression"
3) Endocrinologia Japonica, 1988, 35(2):333-342, "Inhibitory effect of glycyrrhetinic acid on testosterone production in rat gonads." 4) Steroids. 2004 Oct-Nov, 69(11-12):763-6, "Licorice reduces serum testosterone in healthy women"
5) Journal of Affective Disorders, Oct 1994, 32(2):139 146, "Effects of hydrocortisone on brain 5-HT function and sleep"
6) Biological Psychiatry, Mar 2011, 69(6):549 555"Acute Hydrocortisone Treatment Increases Anxiety but Not Fear in Healthy Volunteers: A Fear-Potentiated Startle Study"